The Fellowes® Smart Suites™ Corner Monitor Riser elevates your display to comfortable viewing height to help prevent neck strain. Unique shape fits neatly into desk corner to maximize workspace. Stows laptop or documents underneath to keep desk clutter-free. Three height adjustments for customizable viewing comfort (from 3-7/8" to 5-1/8"). Supports monitors up to 40 lbs. Ideal for corner workstations, this single monitor sit-stand workstation clamps to the rear or side of most surfaces. Sit-and-stand design allows you to position your monitor and keyboard from a sitting position to a standing position to make computing comfortable during prolonged periods. Constant Force lift technology provides fluid, one-touch adjustments. Foldable keyboard holder swings the arm out of the way so you can use more of your desk space. Cable management system routes and hides your cords to keep your desk free from tangled cables. 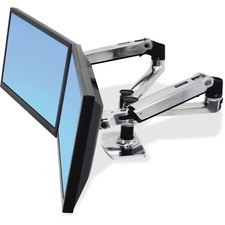 Dual LCD desk mount frees up space and allows positioning of your monitor to reduce eye, back and neck strain. Polished aluminum construction offers greater durability and enhanced aesthetics. Constant Force lift technology provides fluid, one-touch adjustments. Cable management system routes cables under the arm and out of the way. Foldable arms retract into a compact position to allow you to tuck the mount in space-constrained areas. Snap-fit cap secures the interface of the arm to the extension for greater stability. Clamp and grommet mount base ensures greater stability of your monitor and arm. Plus, it includes theft-deterrent anchor holes to attach cable locks. 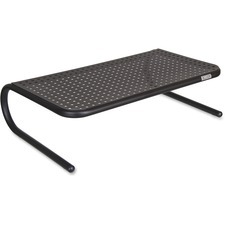 Steel mesh monitor stand helps reduce neck and eyestrain by raising monitor 4" for more comfortable viewing. Two side compartments and a 6" wide x 8-1/4" deep sliding, pullout drawer add convenient space-saving storage for supplies. Mesh construction gives monitor stand extra style, strength and durability. Steel mesh monitor stand is Greenguard Certified. Weight capacity is 75 lb. 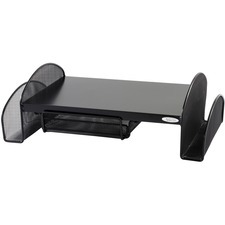 Adjustable Monitor Stand offers a sleek design for a clean look. The slimmer, elevated design can also help you get organized and make the most of your space. Use the recessed platform to keep essential tools (phone, pens, notes and more) close by and easy to find. Height adjusts from 1-7/10" to 5-1/2" for comfortable positioning. Simple add or remove the segmented legs. 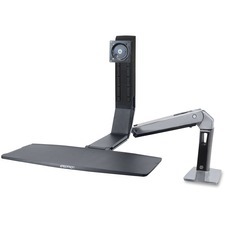 Adjustable stand provides stable support for monitors and laptops up to 20 lb. 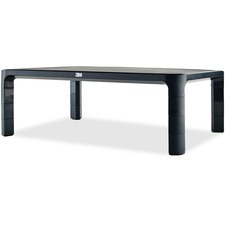 Stand is made of durable plastic. 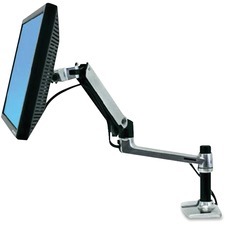 Single LCD desk mount frees up space and allows positioning of your monitor to reduce eye, back and neck strain. Polished aluminum construction offers greater durability and enhanced aesthetics. Constant Force lift technology provides fluid, one-touch adjustments. Cable management system routes cables under the arm and out of the way. Foldable arms retract into a compact position to allow you to tuck the mount in space-constrained areas. Snap-fit cap secures the interface of the arm to the extension for greater stability. Clamp and grommet mount base ensures greater stability of your monitor and arm. Plus, it includes theft-deterrent anchor holes to attach cable locks. 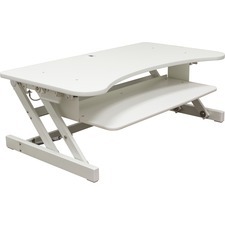 Deluxe adjustable desk riser offers a healthy addition to any desk that allows you to sit or stand while you work. The large worksurface accommodates two monitors or a monitor and a laptop. Ergonomic keyboard tray moves up and down with the desk and moves out/in for the most comfortable position. Five height adjustments allow a comfortable standing position. Height adjustments can be set at 6-7/10", 10", 13", 15-2/5" and 16-1/2". Easily raise or lower the riser with the adjustable paddles in the front for user-friendly operation. Gas spring will allow you to easily move the desk up and down, even with your computer equipment. Riser is fully assembled for use right out of the box. Metal monitor stand helps your computer fit into your life in function and form. Forged from steel, this stand provides a sturdy shelf for your monitor or printer up to 70 lb. 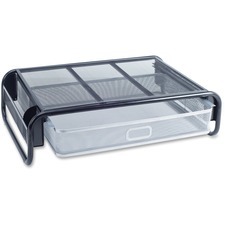 It also leaves a space beneath for your keyboard or other office supplies. 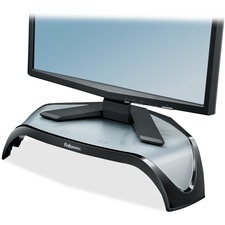 The compact base is perfect for flat panel monitors and even laptops. A simple curved design and powder-coat finish help create a balance between the comfortable feel of your home or office and the technical convenience of your computer.